Austin art is all over the city. Austin is a city that loves art. From street murals to museums, there’s art everywhere. Free museum day is September 23rd, so plan what museums you want to visit now. Read on for the best places to find Austin art! Part of the University of Texas, this is the largest university art museum in the country. They have nearly 18,000 works of art. The Blanton is especially recognized for their European paintings, collection of prints and drawings, and modern and contemporary American and Latin American art. 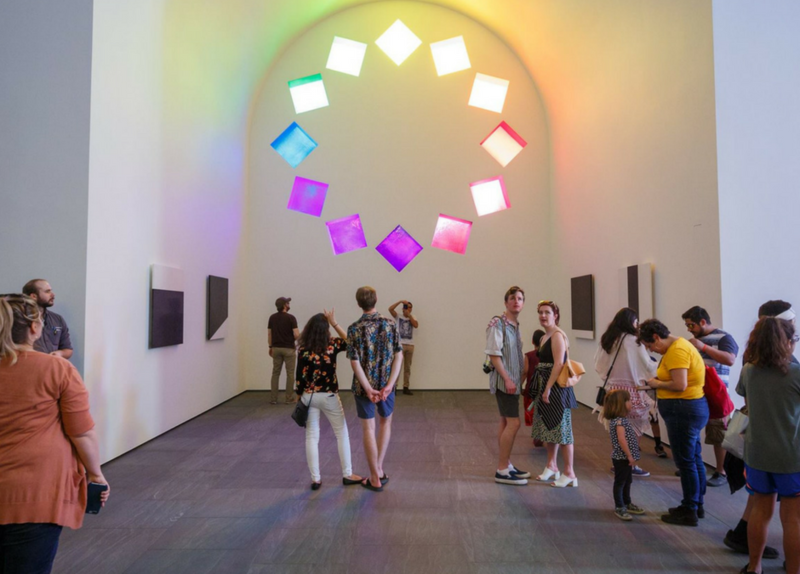 Don’t miss Ellsworth Kelly’s Austin. This 2,715 square foot stone building that resembles a chapel was recently added to the grounds. Free on Thursdays and open until 9pm on the third Thursday of each month. This graffiti art gallery in the heart of West Austin is due to move to new digs soon, so get your photo ops in now! What was once the concrete bases of an abandoned construction project have been turned into works of Austin art by local graffiti artists. Watch out for the poison ivy if you go, though, this is definitely not a manicured space! Best of all, this place is FREE! Come see the Garden from a whole new perspective! Join us January 20 (and every third Saturday of the month) at 2pm for a docent-led tour. Our highly trained docents will lead groups of 20 through the UMLAUF creating a unique and memorable experience rich in history. The tours are free with admission and registration is not required. See you on the 20th! Featuring the works of sculptor George Umlauf, this outdoor gallery is on 4 beautiful acres on the edge of Zilker Park. On the first Tuesday of the month, you can explore the garden for free after hours. Gifted by George Umlauf to the city, the site is where he created his Austin art. The Mexic-Arte Museum’s mission is to showcase contemporary Latin American Art in the middle of downtown on Congress Avenue. Transcending Austin art, it is the official Mexican and Mexican-American fine arts museum of Texas. They have approximately 3,000 pieces in their permanent collection, mostly from the late 20th and early 21st century. They also have a gallery in the back where they showcase emerging artists. The museum is free on Sundays and all of December. Want to support new Austin artists by purchasing one of their works? The Austin Art Garage on South Lamar is the perfect place to start your Austin art collection! There are works priced at all different levels, in just about any style imaginable, and you can bring them home with you! This is also a great place to get a souvenir, as there are tons of pieces depicting Austin landmarks. Free! Want to find an apartment that’s a work of Austin art? Apartment Experts South can help you find the apartment of your dreams! Give us a call at 512-416-8111!